A travel blog for the everyday working stiff. Chicago is a food city. Chicago has famous chefs. Chicago has famous restaurants. Chicago has famous foods. Wondering what food Chicago is known for? During our girls’ weekend in Chicago, we made sure to try some of Chicago’s most famous dishes. 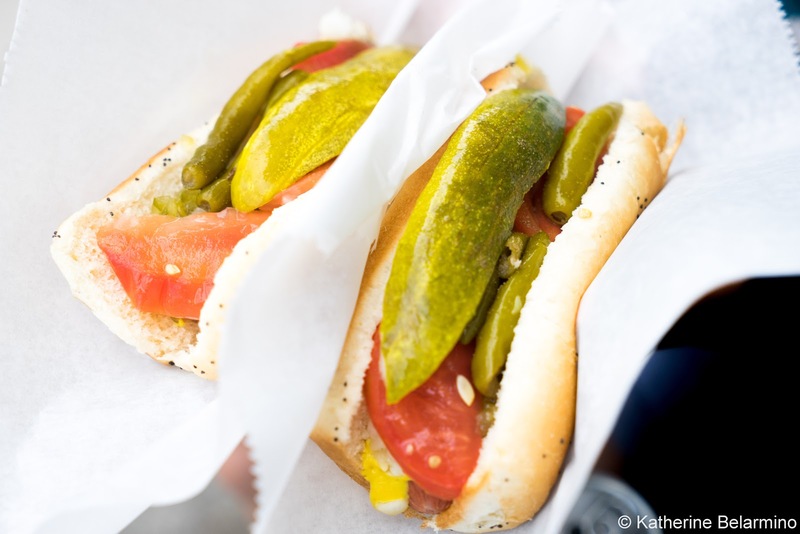 Here are five iconic Chicago foods you must try on a trip to Chicago. Chicago’s most famous and iconic food has to be Chicago-style deep dish pizza. 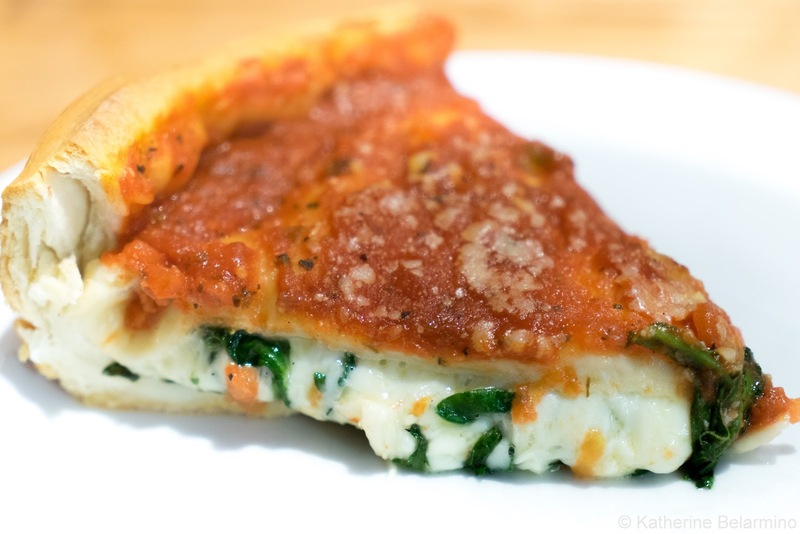 Chicago-style deep dish pizza is believed to have been invented at Pizzeria Uno in 1943. There is sure to be disagreement and lively discussion when trying to settle on the best deep dish pizza in Chicago. On our walking food tour, we visited one of the restaurants touted to serve the best deep dish pizza, Giordano’s. Giordano’s story is that their stuffed pizza started over 200 years ago in a northern Italian town as “Italian Easter Pie.” It’s fitting because deep dish pizza is kind of like a casserole. Giordano’s deep dish pizza is special because it has a double crust. The crust is crunchy and flaky, almost biscuit-like. The pizza is stuffed with cheese and your choice of ingredients like pepperoni, spinach, mushrooms, sausage, green peppers, and onions. There is a very thin layer of crust on top, and then that is slathered with pizza sauce. I really enjoyed my slice of Chicago-style deep dish pizza and am glad I got to try this Chicago signature food. However, I am also glad we did this on a food tour. Otherwise, we could have been waiting for a couple hours, and I really didn’t need more than once slice, as I am a thin crust Italian pizza kind of girl. On the Chicago Favorites Food Tour with Bobby’s Bike Hike Chicago that I found and booked on Vimbly (a great website for discovering and booking tours of all kinds), we showed up, we were seated, a pizza was delivered, we ate our slice, and then we were back outside and on our way to the next stop. Another Chicago must eat is the famous Chicago-style hot dog. I like hot dogs, especially a good and completely unhealthy chili cheese dog on occasion, but I wouldn’t necessarily call myself a hot dog lover. However, I made sure to have a Chicago-style hot dog during our Chicago weekend getaway. After all, it is yet another Chicago food staple. For my Chicago-style hot dog experience, I chose Kim and Carlo’s Chicago Style Hot Dogs cart, which can be found at the Museum Campus near The Field Museum and Shedd Aquarium. 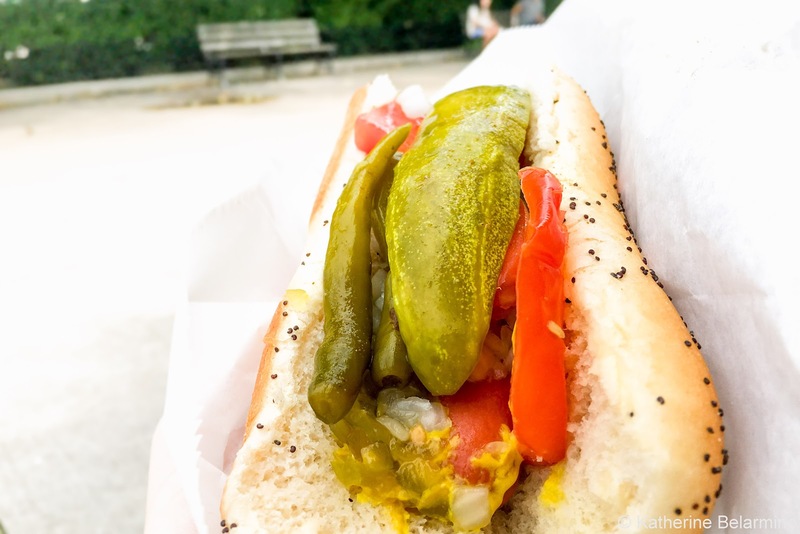 A Chicago-style hot dog is an all-beef hot dog on a poppy seed bun topped with mustard, relish, onion, tomato, sport pepper, celery salt, and a pickle spear. That’s a whole lot of toppings for one little wiener, but they make for a crazy delicious bite. It’s all about the sport pepper, something I hadn’t heard of before visiting Chicago. Just one thing, don’t ask for ketchup! The sign at Kim and Carlo’s threatens to make customers dance for ketchup. As a famous Chicagoan, President Obama, has made clear, including recently to Anthony Bourdain, you should never, ever put ketchup on a hot dog. An Italian beef was not something I was familiar with before my Chicago trip. But in Chicago, it is a classic and a staple. In fact, on a boat tour we took later in the trip, the guide mentioned how he went on vacation to another state and couldn’t believe he couldn’t just go somewhere and order an Italian beef. On our same food tour where we went to Giordano’s for deep dish pizza, we also visited Al’s Beef, which has been making Italian beefs for Chicagoans since 1938. 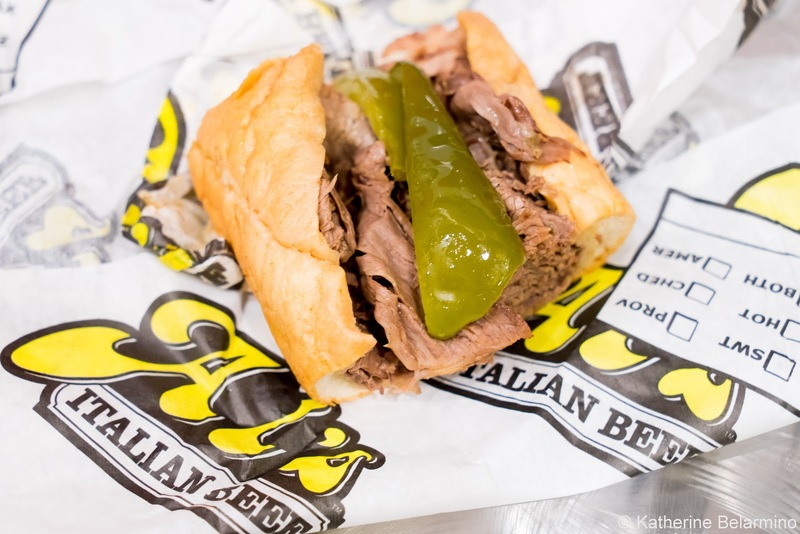 An Italian beef is kind of like a French dip. An Italian beef starts with tender, oven-roasted, Italian seasoned beef sliced paper-thin which is then dumped into the juicy gravy to soak up even more flavor, all served in a fresh Italian roll. You can order your Italian beef dry (no extra gravy), regular (just a little gravy), wet (lots of gravy), or dipped (throw the whole sandwich in the gravy and let it all soak in). There are also extras that can be added to the Italian beef: provolone cheese, homemade spicy giardiniera, or homemade sweet peppers. I love ice cream. Ice cream is probably my favorite sweet. When I was planning my trip to Chicago, I was scrolling through Instagram pictures and stumbled upon a glorious sight, a rainbow cone. 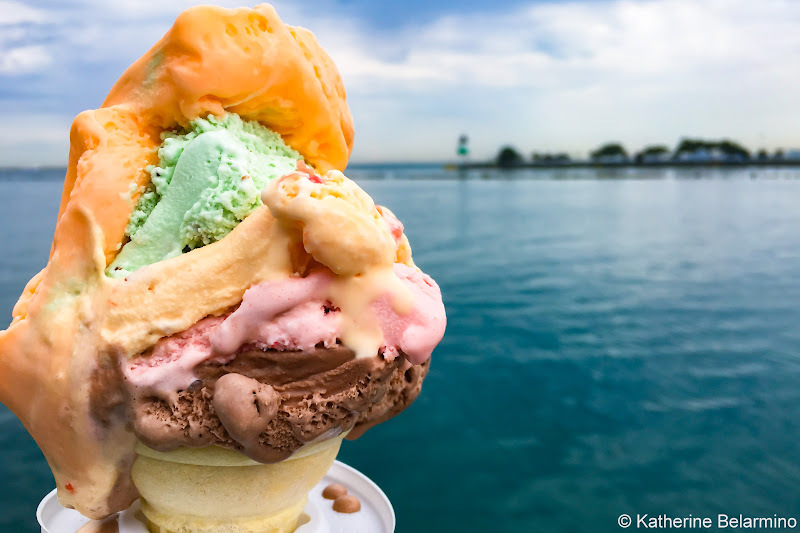 The Original Rainbow Cone first opened in Southside Chicago in 1926. Recently they opened a new location on the Navy Pier, which means travelers can combine a visit to a popular tourist attraction with tasting an iconic Chicago food. The rainbow cone is a layered ice cream cone with chocolate ice cream, strawberry ice cream, Palmer House (New York vanilla with cherries and walnuts) ice cream, pistachio ice cream, and orange sherbet. The rainbow cone was everything I imagined it would be, absolutely delectable. Did you know brownies were invented in Chicago? Bertha Palmer of the Palmer House was responsible for the invention of the brownie in 1893. Bertha Palmer directed the Palmer House Hotel chef to create a dessert to be served at the Columbian Exposition World Fair that was easy to eat, small, and dense so it wouldn’t fall apart. 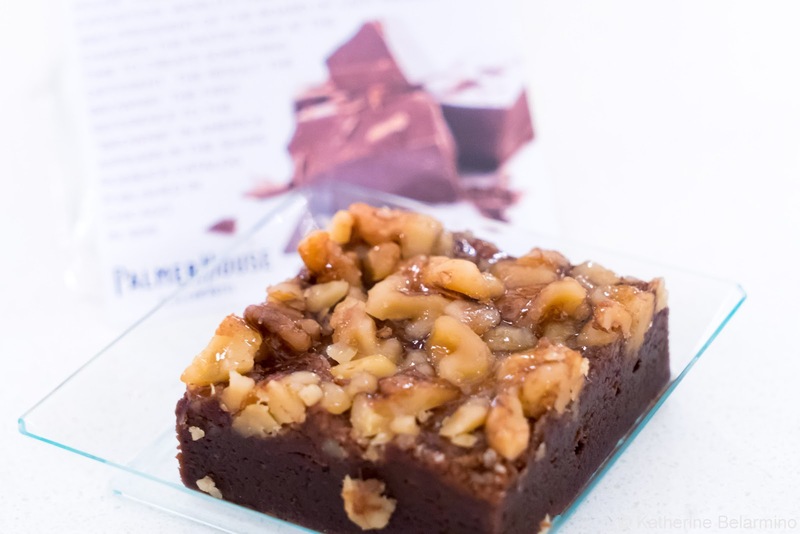 The world famous Palmer House still serves brownies today made with the exact same recipe and they even provide the original recipe so guests can try it at home. Melt chocolate and butter in a double boiler. Mix sugar and flour in bowl. Add melted chocolate and butter. Stir four to five minutes. Pour into 9x12 baking sheet. Sprinkle walnuts on top and press down slightly. Bake 30-40 minutes. Brownies are done when edges are crisp and brownies have risen ¼ inch. Middle will be gooey. Combine water, preserves, and gelatin in saucepan. Mix and bring to boil for two minutes. Brush hot glaze on brownies while warm. My quest for eating some of Chicago’s most famous foods was successful and scrumptious. 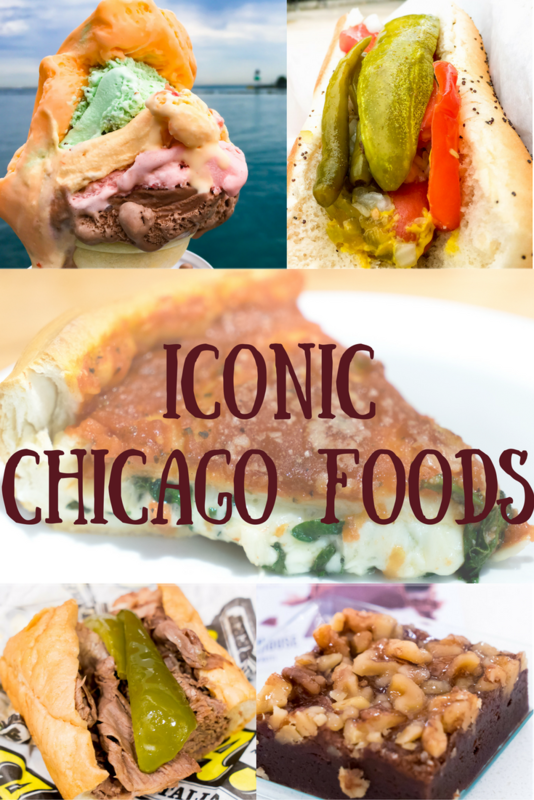 Unless you’re a vegan (in which case, all I can say is I’m sorry), you absolutely must try these iconic Chicago foods when in the Windy City. Thank you to Vimbly for hosting our Chicago food tour and making this post possible. As always, all opinions are my own. This article contains affiliate links. If you book through them, it costs you nothing extra and we earn a small commission that goes towards running this website and bringing you more travel stories. Did you enjoy this article? Want more travel stories and inspiration delivered straight to your inbox? Get an email when we publish our next one! Just enter your email address below. Katherine Belarmino and Romeo Belarmino are the authors of Travel the World, a travel blog for the everyday working stiff. They work full-time in non-travel related jobs, but take every opportunity they can to travel the world during their limited vacation time. I'm Katherine, and my husband Romeo and I are part-time travelers. We work full-time but use our vacation time to travel the world. We experience all we can on our travels, including culture, adventure, food, and a little golf (for Rome). Travel the World is our place to share our travel adventures and help others plan their world travels. Get our latest travel stories, travel destination information, and more straight into your INBOX for free. Just Enter your email address, Verify and join the Travel the World family!